Every winter Rio de Janeiro sets out the greatest Christmas tree in the whole world, and we invite all of our guests to make sure they view it in the middle of our lovely Lagoa while they visit! Certainly a rare opportunity to see one of the largest Christmas trees visible to man. Beautifully lit up, the Arvore do Natal is certainly a site to behold. Novas Frequências Experimental Music Festival! Novas Frequências festival hits Rio this month! Spanning Dec. 1 – Dec. 14th, Rio de Janeiro’s most experimental music festival will be bringing together some of the more genre spanning and innovative acts across the world! Curated by DJ Chico Dub, the festival will be occurring across the city at various venues, with some shows free, and others anywhere from R$ 10-50. Please consult the below website for more information! 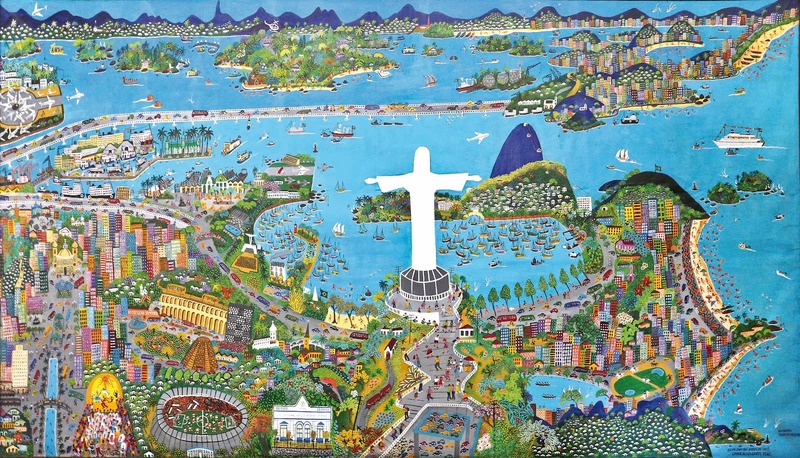 Enjoy Naïve Art in Rio at MIAN! If you plan on seeing Christ the Redeemer while in Rio, don’t forget to check out the Museu Internacional de Arte Naif next to the Cosme Velho train station! A celebration of contemporary and historical naif art, guests are encouraged to try producing some of their own after enjoying some of the museum’s works, including the world’s largest naif painting at 24m wide! Those who bring their Cosme Velho train ticket to see the Christ the Redeemer statue are entitled to a 50% discount on the entrance fee for the museum.